Spring is coming, people! Time for a little pre-season wardrobe prep! If you read this post, you'll know that I like to tick off all of my shopping and general wardrobe improvement/maintenance tasks in one go, twice a year just before the new seasons in late February/early March and late August/early September. Between those months I keep my shopping to a minimum, but when it's wardrobe overhaul time again, I set aside at least a full weekend to look at what’s currently in my closet, dust off last year’s warm-weather essentials and plan out my go-to looks for spring. If a whole weekend sounds like huge amount of time to you, you're right ... but: compared to my bargain-hunting years when I would go shopping almost every weekend and end up with a ton of ill-fitting, mismatched stuff, it’s really not that much. I spend way less money and time overall, and I'm much happier with my wardrobe, because looking at it in-depth and as a whole makes it a lot easier to come up with something that's functional and cohesive, rather than just a mish mash of individual pieces that don’t work with each other. For today's post I thought I'd give you a little tour of my typical 6-step process for overhauling my closet, including some examples from my inspiration board for this season. To see the entire thing, click here. Note: This guide is for people who already have a pretty good idea of their own personal style and just want to update it a little for the new season. If you are super unhappy with the majority of your clothes, try the 10 Step Wardrobe Revamp instead or check out the INTO MIND workbook. I know I say this a lot, but that's because it's so so important: The perfect wardrobe should not only reflect your personal style but also be optimally tailored to your lifestyle. So before you get into the creative side of things, make sure you look through your schedule and plans for the upcoming 3-6 months. What kinds of activities will you need outfits for? What will you be doing all day, what special events do you have planned? Any trips or longer vacations? Make a big list of all of the different activities and then organise them into groups like ‘casual daytime wear’, ’work attire’ or ‘black tie’, to give you an idea of how many clothes and outfits you will roughly need per category this season. If you like (and you’re a nerd like me) you can even create a pie chart like the one in this post to give you a visual summary of your lifestyle this season. As a second step, take a few minutes to reflect on last year’s spring wardrobe. Which pieces and outfits did you enjoy wearing the most and why? Write a little one-paragraph summary and try to identify the key elements of your 2014 spring style, e.g. pastel shades, high-waisted shorts + flowy tops, preppy and so on. Next, ask yourself how your personal style and lifestyle has changed since last spring and which aspects of last year’s wardrobe you can imagine wearing this year as well, and which you have outgrown. At the end, go through your current closet and any spring/summer pieces you have in storage and pick out everything that you might want to include in this year’s spring wardrobe. Take notes of any obvious gaps while you are at it. What I wore last spring: Lots of denim shorts and ankle-length, skinny trousers + loose-fitting t-shirts. Leather jackets. Delicate jewellery. Sneakers and brogues. Black, black, more black + pastel accents. Major life/style changes since then: Work from home now/no dress code. I feel more confident about my body now and much braver when it comes to trying bold cuts or colours. Keep wearing: Ankle-length denim, brogues, most of my jewellery from last year, most outerwear. Changes: Less black, more light neutrals. More tailoring. Fewer skinny jeans, more 'Mom' jeans. More fitted tops. More patterns and non-neutral pants. Time for the fun part! Grab a cup of coffee and then give yourself at least a couple of hours to figure out what overall look you want to go for this spring season. Colourful and bohemian? Stark and minimalist? What colours do you want to wear, which materials, which silhouettes? What do you want your go-to looks to be, what your special occasion attire? Browse Pinterest, your favourite blogs, look books and online shops and save every image that speaks to you in some way in regard to your spring wardrobe (on a separate Pinterest board, a folder or a real-life mood board). Throughout the whole process always keep your lifestyle in mind and focus on collecting inspiration and concrete outfit ideas you could replicate. Once you have collected a good chunk of images, go over everything again and get rid of duplicates or things that don’t really fit the vibe of your board. At the end, inspect everything from a bird’s eye view. Do you love it? Are those things you would want to wear in real-life? If not, keep tweaking your board. Otherwise: Break it down into individual elements, like colours, combinations of items, single pieces, etc, i.e. actual tangible things that you can incorporate into your wardrobe this season. Read this post for more info on how to dissect a mood/inspiration board. Building your wardrobe around a few key proportions is the easiest way to give it structure and make sure it’s mixable, versatile and easy to travel with. A proportion is essentially a formula for a certain combination of item categories, like skinny jeans + blazer + flared top + heels, that you can wear in lots of different version. The idea is that you select a few proportions that suit your lifestyle and style, and then curate a few different versions of each item category that you can all mix and match. If your proportion consists of 3 item categories (like a fitted jacket + knee-length dress + brogues) and you own 3 versions of each category in a range of colours and styles, that makes 27 different combinations to choose from! Of course, the goal here isn’t that you only wear your 2-3 proportions from now on, but to make sure your wardrobe contains a strong foundation of mixable pieces. To-do for this step: Choose about 2 to 3 proportions that reflect the overall look you defined in your inspiration board and that suit your lifestyle this spring. For lots of examples, check out the proportions catalogue. Once you have clearly defined your overall style direction for the season and picked a couple of proportions to give your wardrobe structure, it’s time to go shopping! But: Instead of just hitting the high street and grabbing whatever looks good, spend a little time beforehand to really figure out which handful of pieces would make the biggest difference to your existing wardrobe. 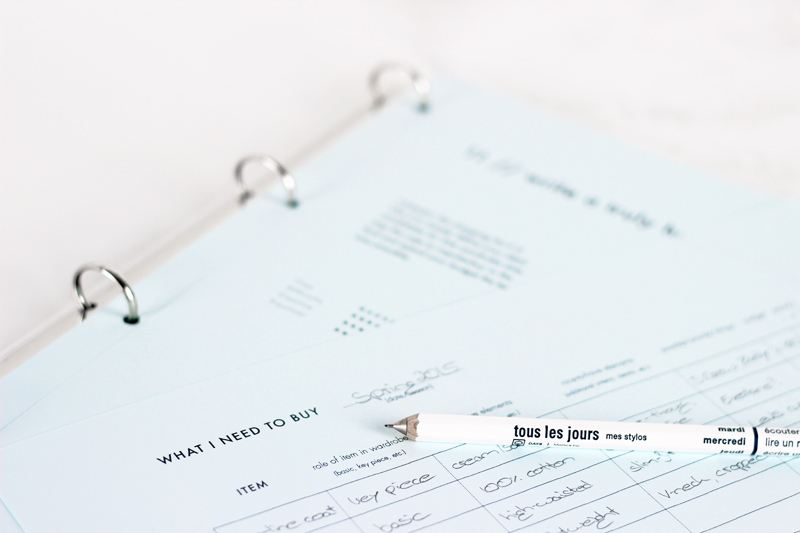 Use the 2-3 proportions you picked during the last step as your starting point and write down which item categories you still need a few pieces from. Aim for at least 2, ideally 3 versions per category. For example, if you chose flared skirt + fitted shirt + ballerinas and skinny jeans + lightweight sweater + canvas sneakers as your two proportions and you already own tons of fitted shirts, jeans and sneakers but none or few of the other pieces, your shopping list may be 1 flared skirt, 2 pairs of ballerinas and 2 lightweight sweaters. Once you know which types of items you need, you can start to fill in the details, i.e. which colour, details, materials and so on. Go back over the inspiration board you created for step 3 and figure out which concrete pieces would allow you to best create the overall look you are going for this season. On top of that, you can of course also add a few more things to your shopping list, like jewellery, other accessories, accent pieces or other items that aren’t a part of your 2-3 proportions but really signify your spring style (e.g. a great jacket that you can pair with everything). What's key is that you take the time to think these things through BEFORE you hit the shops and see what’s available, to prevent impulse buys and make sure any new wardrobe additions really do express your style and work with the rest of your clothes. As a last step, once all the shopping is done, take about half an hour or so to really familiarise yourself with your new and improved wardrobe and work with it. Go back over the list of activities you wrote down for step 1 and challenge yourself to come up with as many different outfits for each major life area (work, daytime, nightlife, and so on). And remember: Great styling isn’t just about pairing the right main pieces with each other, but also about all those little things, the accessories, make up, whether you tuck your shirt or roll up the hems of your jeans, so make sure you pay attention to every single detail. Experiment, take notes and tweak, tweak, tweak. Snap pics of your favourites for easy reference later on. If you are out of ideas or aren’t feeling particularly creative, try a couple of styling challenges or though experiments from this post. 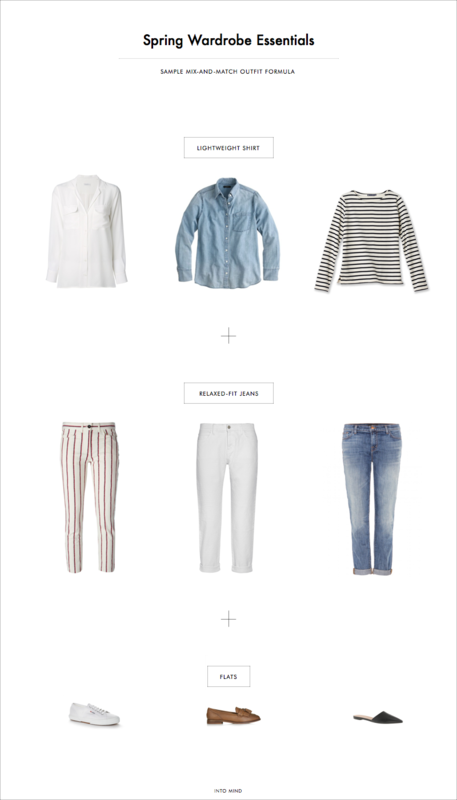 Shirts: White - Equipment, Chambray - J.Crew, Striped - Petit Bateau. Jeans: Striped - Isabel Marant, White - MiH Jeans, Light wash - J Brand. Flats: White - Superga, Tan - Topshop, Black - J.Crew. Jeanne Damas by Carolines Mode,The Silk Sleeveless by Everlane, Lidka N, Kiera Knightly as Gretta in Begin Again, Alexa Chung for Tommy Hilfiger, Edith A. Miller.